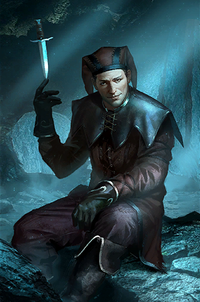 Keeper Cicero as seen in Legends. Cicero was an Imperial assassin and Keeper of the Dark Brotherhood. As Keeper, he was responsible for caring for the Night Mother's body and casket. Little is known of him before 4E 186, when he arrived at the Dark Brotherhood Sanctuary in Cheydinhal and started keeping a journal detailing some of his many contracts. When the Night Mother's crypt in Bravil was desecrated, the coffin was brought to Cheydinhal, and Cicero was appointed Keeper. He was an accomplished assassin who was extremely deadly with a dagger, and while honored to become Keeper, he was reluctant to abandon his work. Before starting his new duties, he was allowed one last assassination, an unnamed jester whose laughter Cicero never forgot. As the Dark Brotherhood slowly deteriorated over the years, Cicero fled to Skyrim with the Night Mother's body, where one last chapter of the organization remained active. He hoped to find a haven for the Night Mother, and to find a Listener who could rejuvenate the Brotherhood. However, by this time in 4E 201, Cicero had become mentally unstable, and it's unknown how much success he had.